Twinkle Twinkle Little Star is probably one of the first songs you hear a toddler sing. It’s timeless appeal and charming simplicity never seems to fade. 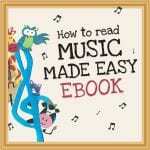 The repetitive nature of both the words and melody makes this an easy song easy for toddlers to learn and they will often hum along with the tune long before they can manage the words. They love miming out the simple actions and for a toddler whose words are not quite ready, this is both a satisfying and reassuring means of communication. The easy craft below makes a sensory jingly star mobile that can be used with supervision as a prop for singing the song. Listen to the YouTube clip below as a sing-a-long track, or as a lullaby to settle little ones down to sleep. 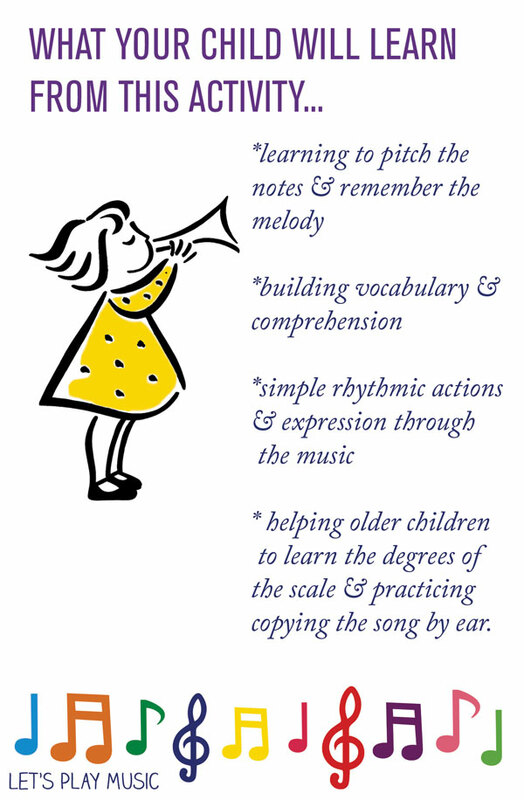 For older children, Twinkle Twinkle is excellent practice for learning the Do – Re – Mi degrees of the scale. The opening intervals are Do do, So so, La la, So and this song is a useful memory prompt for remembering the distinctive sound of these intervals. With a little practice, it is easy enough to play the whole tune on the chime bars (see tutorial below). Children of around 5 years are soon able to recognise the intervals, copy them and have a go at playing the tune themselves. 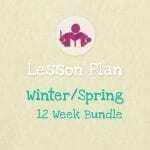 This is excellent for developing listening and memory skills. If you don’t play an instrument yourself, watch the chime bar tutorial and see the way the notes jump from Do – So at first, and then just go back down the scale in steps, then the whole tune repeats again. For children who are just starting to learn the piano, Twinkle Twinkle is a fantastic early piece. It always goes down well because of the familiar tune. If your child is beginning to learn the piano, you can print off beginner-friendly sheet music for Twinkle Twinkle Little Star, as well as follow the step-by-step lesson plan on how to teach it at home here. 1. You will need: silver/gold paper plates, silvery or see-through string/cotton, silver bells (these came off an old instrument but you can get them in craft shops), an all year round ring (how to, here) or a nice rustic looking stick and scissors! 2. Draw out your star shapes on the back of the plates, try and make them have matching pairs (I used the first one of the pair as a template for the second). 3. When drawing your stars try doing them in a variety of different sizes as it looks a little more interesting! 4. Securely tie a long length (about a metre) of silver thread and thread it through the back of the bell. Tie the two ends together with the bell at one end and the knot at the other. 5. Glue one side of the star, and use its pair to sandwich the string between them. You can stick a few stars along the string of different sizes. 6. Repeat steps 4 and 5 until you have a few strings of stars with a bell at the bottom. 7. Fasten the star strings to your all year round ring, or to your stick and voila! 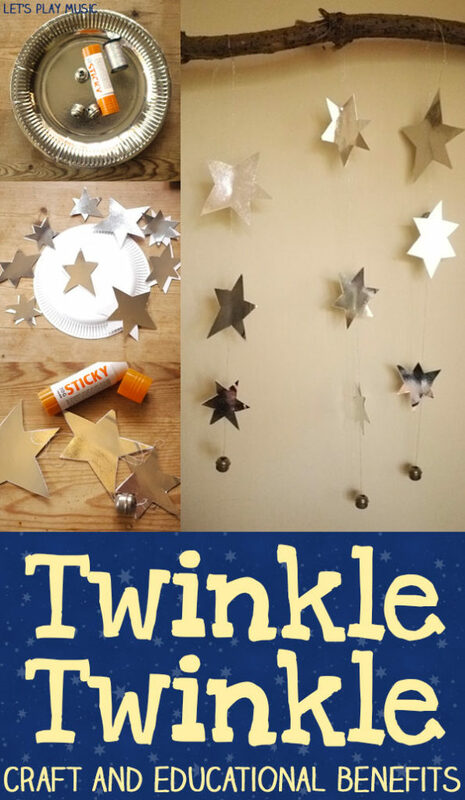 This craft is only intended as a decoration with adult supervision as a little activity to accompany Twinkle Twinkle Little Star. I definitely wouldn’t recommend using it unsupervised just incase the bells were pulled off or fell off! Thanks Kate! and thank you for choosing us to feature on Share it Saturday – what a compliment! Thanks Kate 🙂 and thanks also for featuring us! What fun! I really like your mobile!